In the song "I Am A Child", Neil puts forth one of his more famous lyrical puzzles. Young sings "What is the color when black is burned?" An interesting riddle, that only Neil knows the answer to, but last I checked, the answer appears to be "dark black". But could there be another color? Or is this really a question about colors? Some have interpreted the lyric to really be more of a statement about emotions and the heartbreak of love. Others think the answer is blowin' in the wind. The imagery of the lyrics are wonderful and paint a visual picture of the pressures of a rock & roll star crossed with the metaphor of the impossibility of blowing smoke rings on a windy day. Such lyrical mixtures are typical throughout his long songwriting career spanning four decades and hundred of songs. Yet lyrics as simple as "Keep on Rockin in the Free World" can take on multiple meanings in various concert settings. Once an anthem for the Berlin Wall falling, it has taken on different explanations with the Persian Gulf War, 9/11, and the war on terror. The symbolism within Neil's song lyrics are often a prism when held up to the light of day refracting with different stories behind the music. For example, Lynard Skynard's "Sweet Home Alabama" which was written in response to two Young songs, Southern Man, from the album After the Gold Rush, and Alabama, from the album Harvest. Certainly, Lynard Skynard's interpretation of Neil Young's songs probably wasn't what he intended. 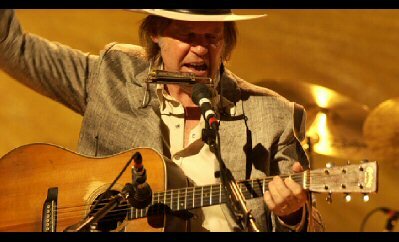 Through the dozens of Neil Young albums and thousands of concerts we are able to only begin to speculate on the meaning of his songs. So we keep searching for that Heart of Gold. As Young sings in Ambulance Blues: "It's hard to say the meaning of this song." There's more to the story behind the music than meets the eye. 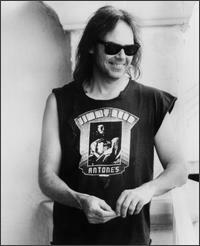 So here are a few essays on the lyrics of some of Neil Young's best songs. *To comment on the lyrics of "Powderfinger" only, go here. "When God Made Me" Lyrics from "Prairie Wind"
"Southern Man" & "Alabama" - Interpretation in the context of Lynard Skynryd's "Sweet Home Alabama"
Mirror Ball's "I'm The Ocean"
Also see So Who Was The "Cinnamon Girl"? The Story Behind The Song. No insight into the "purple words on a gray background" though. Purple is usually the color of passion and gray symbolizes bleakness. So many have interpreted the phrase to mean a love letter to someone during a relationship breakup. "One of the best produced tracks, with brilliant banjo and steel guitar. The song was inspired by an old man who lives on Young's ranch: "Old man look at my life/I'm a lot like you were." Familiar themes of loneliness and lost love are also present: "Live alone in a paradise that makes me think of two" recalled with a certain pain "love lost/such a cost/give me things that don't get lost." Yet he is still searching for a heart of gold: "I need someone to love me the whole day through/Oh one look in my eyes and you can tell that's true." James Taylor and Linda Ronstadt again provide backing vocals." "All it is is four notes on the bass. Billy [Talbot] plays a few extra notes now and then, and the drumbeat's the same all the way through... Sometimes it does sound as if we're really playing fast, but we're not. Its just everything starts swimming around in circles. "We were all really high, fucked up. Been out partying. Wrote it sitting up at Vista Point on Skyline. Supposed to be the highest point in San Mateo County, which was appropriate. I wrote it when I couldn't sing. I was on voice rest. It was nuts - I was whistling it. NEIL: "Well, it's not literally a specific town so much as a feeling. Actually, it's a couple of towns. Omemee, Ontario, is one of them. It's where I first went to school and spent my 'formative' years. Actually I was born in Toronto... *I was born in Toronto*... God, that sounds like the first line of a Bruce Springsteen song (laughs). But Toronto is only seven miles from Omemee." 'Will To Love' , Young defiantly insisted many years later, "might be one of the best records I ever made". Which only goes to prove that artists are not always good judges of their own work. There is something deeply unconvincing about the laborious lyric, which equates a fish struggling to survive in the sea with Young's own flounderings in the ocean of life. Recorded solo and acoustic on a two-track cassette, Young enthused about the song to the writer Bill Flanagan in 1990, "I was all alone in my house and I was high on a bunch of things. I was really out there and I wrote the whole thing and put it together. None of the verses are exactly the same length. They're all a little different. 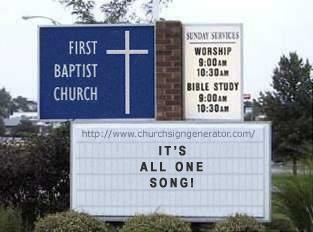 I never sung it except for that one time." This isn't strictly true. Young had attempted to rehearse the song for the Long May You Run album, but complained that he kept "forgetting what I was doing, losing it totally and getting all pissed off because it didn't sound right." Adapted from a post by Thrasher on An Aquarium Drunkard: Stop Sniffin' That Smokin' Gun. Neil Young has always had the touch with a clever turn of a phrase. And there are lots of clever turns of a phrase in the lyrics "Mideast Vacation". My favorite is the line about "Stop sniffin' that smokin' gun" in the context of fighting terrorism. Unbelievably, as we all know, as the U.S. ramped up it's saber rattling in the runup to invading Iraq in 2003, National Security Advisor Condoleezza Rice uttered the famous line regarding weapons of mass destruction that "We don't want the smoking gun to be a mushroom cloud." In retrospect, it seems as if Condi should've stopped sniffin' that smokin' gun. In the second verse, if you replace the name of Libyan dictator Muammar Khaddafi with Sadam Hussein or Osama Bin Laden, you have an eerily prescient prediction of events that took place almost 20 years later. From the Decade album, Neil writes: "I'm not a preacher, but drugs killed a lot of great men." The song is about Danny Whitten, a guitarist in the band Crazy Horse who became addicted to heroin. So Young kicked him out of the band, gave him a plane ticket and $50 to go to LA, enter rehab and clean himself up. Instead, he spent the money on more heroin and ended up overdosing. Purportedly, inspired by the song 'The Needle of Death' by the musical genius Bert Jansch. There has been a lot of speculation as to what the line ""milk-blood to keep from running out" actually means. Here are some interpretations. Milk is a verb and referring to donating blood to a blood bank to earn money for a fix. Heroin addicts do "milk" their own blood, then re-inject it for a high. Since they've been doing heroin for so long, their blood has enough to give them a fix. Injecting milk into the veins of someone who overdosed is thought to help bring them out of it. Hence "Milk blood to keep from running out" with "running out" meaning one is dying. "Milk blood to keep from running out", refers to registering blood back into the works confirming venipuncture, so the shot doesn't "run out" into muscle. There is a deeper meaning than just drug use in this song. The needle isn't just referring to drugs, it's talking about a record needle. 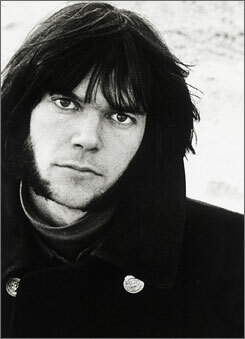 The song is possibly about how Neil Young has seen the consequences of fame in his friends and himself. Maybe the line "I sing the song because I love the man/I know that some of you don't understand" is Neil saying that he plays music for himself and for his fans, but some other musicians only play for the money and fame so they can't understand that. It's more about being addicted to fame than drugs. Drugs are part of the equation, so that's the metaphor that is used. "Only Love Can Break Your Heart": Young sings about Nash after his relation with Joni Mitchell ended. "Hippie Dream": about "Wooden Ships". "Buffalo Springfield Again": obviously about SS and NY. "The Old Homestead": song from Hawks and Doves about his relationship with CSN, Elliott Roberts, Ahmet Ertegun and others. Lots of references to riders, birds, horses, shadows. So what do you think Neil Young's songs mean? To comment on lyrics meanings go here*.